The city surrounds me. A panorama. With arms outstretched, I can't help but spin, taking it all in. Enjoying the view, knowing fully well this may be the last thing my eyes ever see. Jessie is ready to start college. Her entire life has been her and her mom. No dad, no grandparents or family friends - just her and her mom. And now her mom has died of cancer. Jessie rents an apartment because she can't live in the house she lived in with her mom and tries to start over but when the college calls and says that her financial aid form can't be accepted because her social security number shows as belonging to a dead person, Jessie begins to question her entire existence. She doesn't know who she is or where she comes from and everything in her life is even more bizarre because she can't sleep at all and it's been days since she slept and her life is becoming even more confusing. Her confusion can, at times, make the story confusing for the reader but I think that's what the author intended. The novel is told from two viewpoints - Jessie's story is about what she goes through after her mom dies and her mom's backstory is told by her mom about her life before Jesse was born. While we are keeping up with Jessie's confusing life, we are getting a fairly calm but difficult story about her mom's desire and inability to have children which leads us back to the question of Who is Jessie and where did she come from? This was an enjoyable suspense novel that kept me turning the pages until the end. I loved this book...but the ending stunned me. I like Mary Kubica - and I think I'd enjoy this one. Thanks for sharing. I'm featuring Broken Ground this week. Broken Ground is a new one to me and it sounds great! Sounds like the main character is the epitome of an unreliable narrator? Or is she just really confused? I thought that she was sleep deprived and REALLY confused. Yes, being sleep deprived can do that. Good choice! I have this one in my TBR pile. It does sound suspenseful. Glad you enjoyed it. Mary Kubica is an author who has been recommended to me again and again over the years and I do have one or two of her books on my 'Want To Read' list, although I have yet to read any of them. 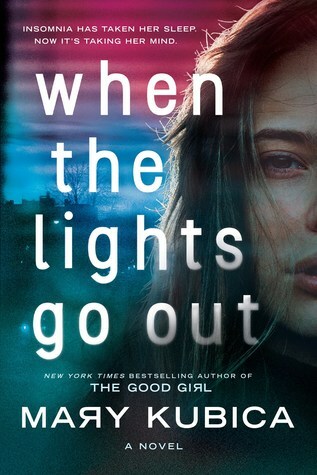 It seems that, although many of my Goodreads friends who have reviewed 'When The Lights Go Out', have nice things to say about Mary's writing, the acutal ratings for the book are quite low, as no-one really understands, or likes, the ending. This might be a case of subjective reviewing however and is one of those books I need to read for myself, to form my own opinion. Yvonne, I think this is a love it or hate it book and people seem to have very strong reactions to it on both sides. The ending is a surprise and that's what I like in a book. Hope you get a chance to read it. This book was very good. I've been wanting to read this author. This book sounds so good. I've heard of Mary Kubica a fair bit, maybe I'll pick this one up!